The annual Culture Day ceremony to award the Order of Culture to people who have made extraordinary contributions to develop culture was held in the Matsu no Ma hall of the Imperial Palace. The recipients were the novelist Hiroyuki Agawa, the Japanese-style painter Fuku Akino, the scholar of Anglo-American law and constitutional law Masami Ito, the Japanese studies authority Takeshi Umehara, and the biochemist Saburo Tamura. 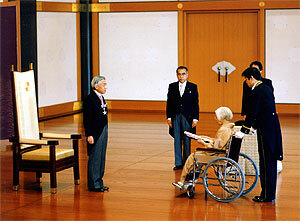 His Majesty the Emperor awarded the decorations to the recipients, after which Prime Minister Keizo Obuchi handed them their patents of decoration.